Clients: Ms. Christine U. G. & Mr. Dietmar G.
We would like to thank you and especially your guides Hua, Emma and Scott for the wonderful days which we enjoyed in your country. We learned so many new things and got a good impression of your wonderful country. All of you took so much care on us and answered the questions we had with great knowledge and a deep understanding of the context. Naturally there are so many places which we have not seen during our trip and therefore we will try to visit China again. 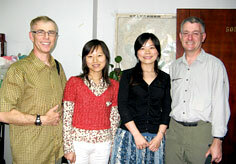 In any case the travel service of Travel China Guide will be then our first contact. We wish you Merry Christmas and a Happy New Year ! P.S. Please find enclosed a few of our pictures we took during the trip. 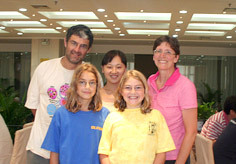 Thank you to all for your efforts in making my trip to China a very special experience. Your dedication to your clients is of the highest standard and the service you provide is second to none. Thank you for your seasons wishes and in particular your thoughtfulness to celebrate my birthday while in Chongqing. The knowledge and friendliness of each of the guides you provided made me fell very much ease and has increased my understanding of China and its history greatly. The skill of your drivers also needs to be commended as they made me feel very safe and comfortable in what I could only describe as a very hostile driving environment. Again thank you to all your staff, and I will return. Wishing you all a very merry Christmas and a prosperous New Year. Clients: Ms. Elizabeth L. E. & Mr. Robert W. S.